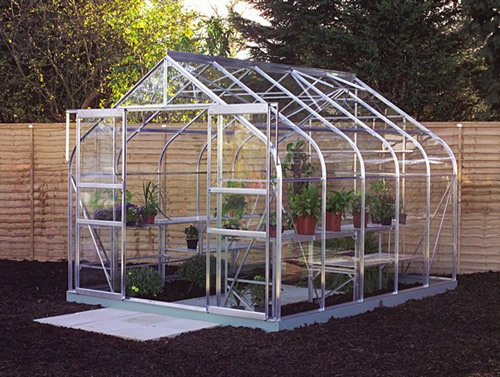 A Supreme 108 Greenhouse manufactured from aluminium is unlike most other greenhouses as its eaves have been curved to give a unique technique. The smoothed edges of this silver Supreme greenhouse gives added height up to 6'9 (2.12m) which will give extra height for all those taller plants. Made elegantly for keen gardeners it comes in eight sizes to suit any sized garden. This model, the Supreme 108 comes with one roof vent for ventilation as standard but more vents can be purchased if you would like. For increased accessibility the Supreme Silver 108 comes complete with a set of sliding double doors and comes with glass. There are two colours available for this green house, silver and green. Please use the drop down box below to select your preferred colour and glazing option. Standard 3mm Short Pane Horticultural Glass - the traditional glazing method allowing sunlight in to nurture young plants. Long Pane 3mm Toughened Glass - allows sunlight to nurture plants in the same way as Horticultural Glass, but gives added safety. It's crucial that you set your greenhouse onto firm level foundations or brick plinth. 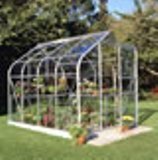 An optional steel base is available to make installation of your greenhouse easier. 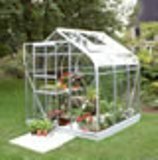 *Please note that the price of £999.00 is for the silver option with horticultural glass. This 8ft modern world championship pool table has many deigns options available. Ideal for use in a garden office. This farm trailer has four detachable sides and a rearside which can be lowered. A Hi-eaves traditional style apex shed 1.83x1.52m available in various configurations. Multi Level Charcoal Barbeque, the innovative BBQ Tower. Compact design with three independent levels. Perfect for outdoor dining.